Every year my mom would order 25-50lbs of green chilies from Hatch, New Mexico. Hatch Green Chilies are some of the best you can find and trust me, they earn their reputation. 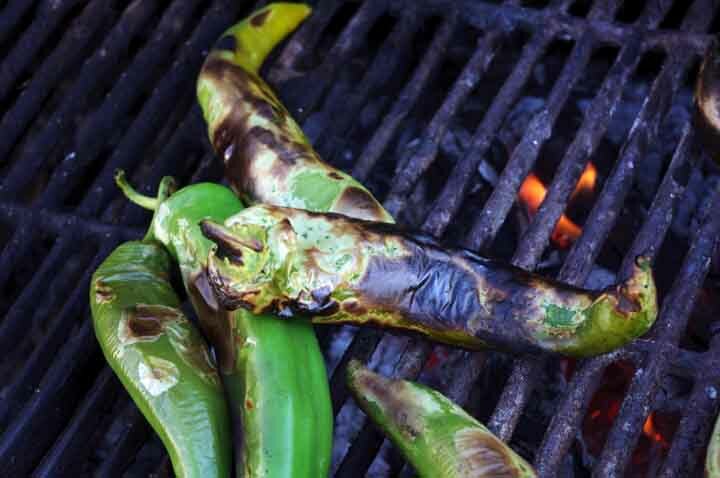 We couldn’t go through the large produce boxes of chilies without them going bad before we even made a dent so we would spend a weekend roasting them on the grill and then freezing them. Freezing really is the best way because they defrost fast under some running water and the skins help protect them a bit from freezer burn. This year we are growing the standard Anaheim pepper. 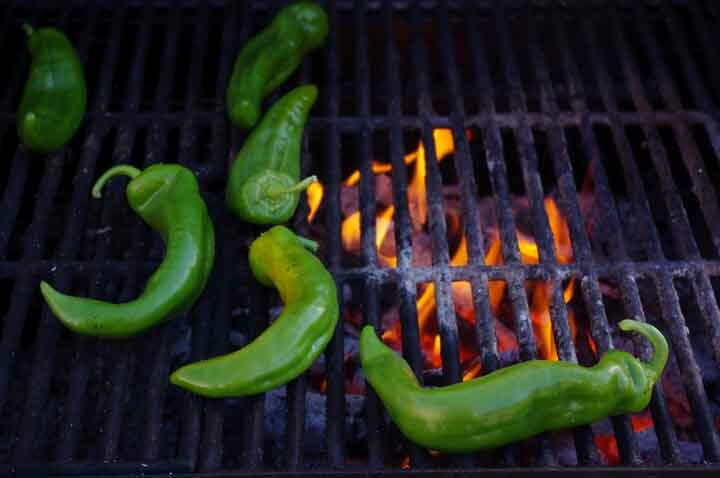 It’s not a particular spicy pepper (some of the Hatch varieties were incredibly hot) but they are perfect for my green chili stew. I harvested about 3lbs and since we were already going to have the grill going it was a perfect time to roast them. When I was younger we would just roast them on a gas grill, but our gas grill here no longer is used with gas so we’re going to actually hardwood fire roast them. It leaves a bit more of a smokey flavor to the peppers, which is nice. The trick with fire roasting peppers is that you want to cook them slow and you do not want to place the peppers directly over the flame or else they will burn, which isn’t exactly what you want. What you are looking for is blistering of the skin. You can get it a little charred but you don’t want to cook it so fast that the skin and pulp burn together and render the pepper useless for cooking. 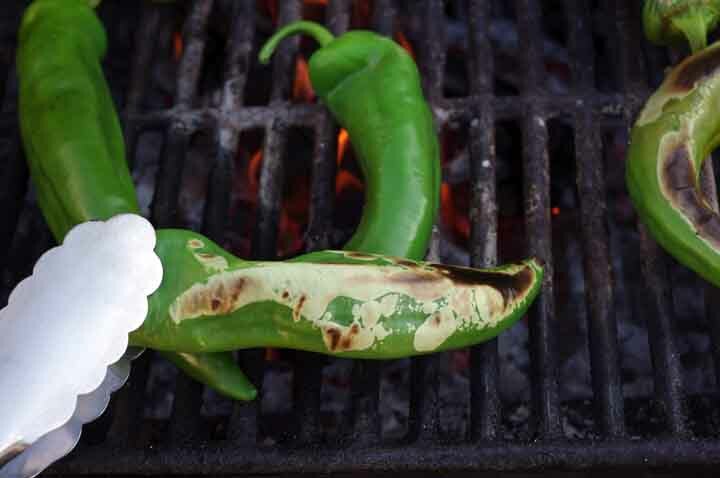 Don’t leave your peppers either because you’ll want to be constantly rotating them to keep them from burning while also evenly blistering. When they are completely roasted the skins will separate all the way around the pepper. The green won’t be as bright and the skin will feel and look like paper. Sometimes they puff up but will deflate quickly when you take them off the heat. I have a cookie sheet ready that I will then place the peppers on to cool off before bagging them up and freezing them. 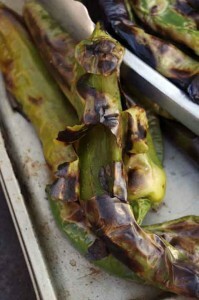 Fire roasting helps separate the the thick skin from the pulp which can then easily be peeled off. This actually depends greatly on the type of pepper you roast. 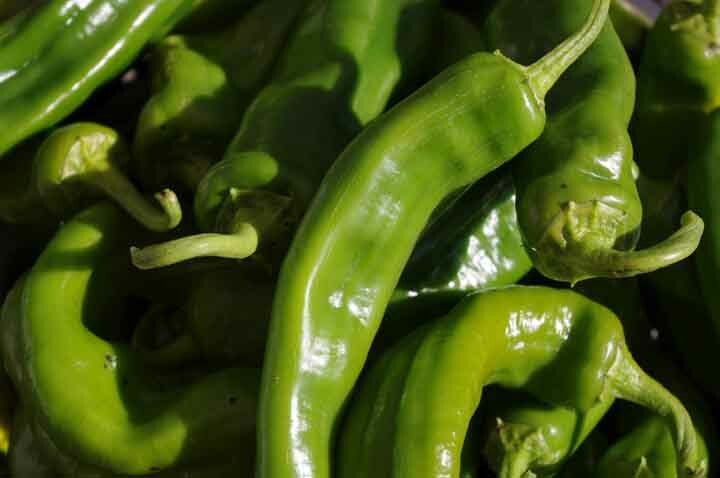 Anaheim-type peppers are the best because the skins are thick while other peppers, like Anchos/Poblanos have thinner skin. Those are much harder to peel after roasting but they are really tasty to roast and can be a bit spicier. Yum! We are roasting poblanos lately…so good! North of Seattle and it is difficult to grow proper chilies. I buy them in early September from farmers east of the Cascades where they can grow beautiful, multi colors and types of peppers. I’ve always had to limit myself on how many because I was not sure what to do with them (other than a week of fresh pepper dishes). This year I will use your fire roasting and freezing (I would never have thought to leave the skin on). Thanks! I hope you are OK with me putting a link to this post in the recipe section of my suburban farm blog.